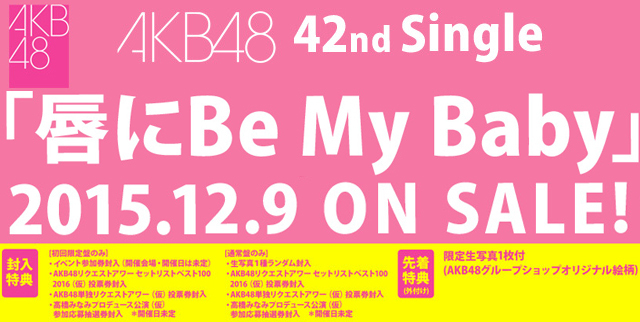 AKB48 to Release 42nd Single “Kuchibiru ni Be My Baby” in December – Hello Asia! “Kuchibiru ni Be My Baby” will be released in four limited CD+DVD editions and four regular CD+DVD types. All of the versions will feature the title track as well as the B-side “365 nichi no kami hikouki.” The DVD will will contain music clips from the tracks on each CD and a bonus movie that varies from type of editon and deals with Takahashi Minami‘s graduation from AKB48. In further news, AKB48 member Iwasa Misaki has announced the release of her fifth enka single for January 6th, 2016. Though the single is still untitled, it will come out in limited CD+DVD and regular CD-only editions. Further details regarding her solo single release will be revealed soon.